As a community hospital, Winchester Hospital places special emphasis on primary care and offers a wide variety of programs and services to support this important aspect of health care. by a personal physician – such as a family doctor, internist or pediatrician – who collaborates when necessary with other medical professionals and coordinates a person’s care. Primary care involves preventing disease or illness, promoting healthy lifestyles, diagnosing and treating health problems, and educating and counseling patients. Find a primary care physician who treats adults on the Winchester Hospital medical staff. Find a pediatrician on the Winchester Hospital medical staff. 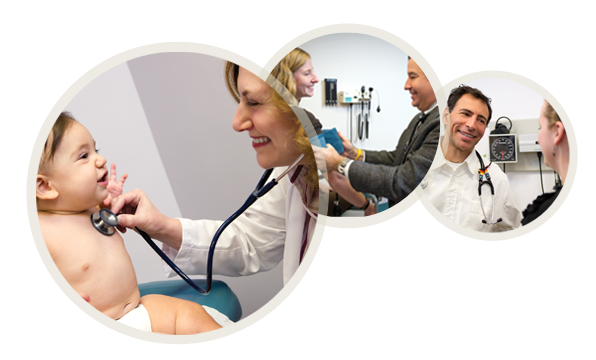 Family Medicine – Family Medicine specialists, also called family physicians, provide primary care to adults and children of all ages. Internal Medicine – Internal Medicine specialists, also called internists, specialize in adult medicine, focusing on the prevention, diagnosis and treatment of conditions that mainly affect adults. Pediatricians – Physicians who specialize in pediatric medicine deliver care to children only, usually from birth until about age 18. Winchester Hospital is proud to offer easy access to a network of physicians who are committed to empowering patients to proactively manage their health and wellbeing. We provide the clinical expertise, information and options they need to make choices about the care they and their families need. Winchester Hospital's primary care network extends through more than a dozen communities north of Boston, and we can help you select the physician who is right for you. Our trained staff is available 24 hours a day, 365 days a year, to help you evaluate your options based on your unique needs and preferences. Practice area – Are you looking for a family physician, an internal medicine physician or pediatrician? Special expertise – Do you have a chronic illness or risk factors that would lead you to request a physician with advanced training or expertise in a particular area? Location – Convenient location can be crucial to having a valued and effective relationship with your primary care provider. Hours and Availability – Do you need to see someone soon? Do you want a practice that offers evening and weekend hours? These are just a few of the considerations that can help you evaluate your options and determine the best primary care provider for your needs. Call 1-866-946-4677 (1-866-WIN-HOSP) for help in finding a provider who is right for you. Join others who have supported Winchester Hospital over the years. Our volunteers help make Winchester Hospital extraordinary.